Have you ever tried Open Face Chinese Poker? It‘s definitely not something that every player has checked off their bucket list, however, it‘s just the right time to get around to giving it a go. 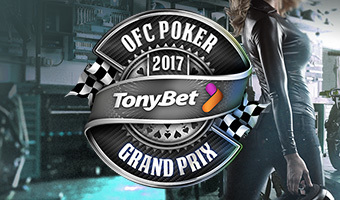 TonyBet Poker have their annual OFC Grand Prix coming up very soon, and the satellites to it have just opened, too. Let‘s take a look at what they‘ve got! First things first – there are GTDs to be won, and we want to know how much you can take back home if you find you‘ve got a natural knack for OFC. All the events combined will give away more than €40,000 and most of the events go above €1,000 GTD, which is pretty good for OFC games, and definitely enough to have a fun poker session. At the end of the series there‘s a Main Event with a €7,500 GTD so it‘s something to look forward to while polishing your skills at the lower risk tables before the big night. The OFC Grand Prix includes 20 different events, with the buy-ins starting as low as €5 for those who just want to try out something new. This is going to be a pretty fun OFC playground, as it has lots of diversity: the games include fan favourites Pineapple, 2-7 Pineapple, and Progressive, plus you‘ll be able to play in Freezout, Turbo, and Re-buy tournaments. The satellites are already running, so make sure to book your spot now! And, of course, there’s a bonus to sweeten the deal for you. TonyBet Poker is offering a 100% up to €1,000 reload/first deposit bonus + a FREE ticket to the Event #1 with the bonus code GRANDPRIX10, with the minimum deposit requirement of €10. If you’re up to indulge in some OFC action, then good luck, and I’ll see you at the tables!